Think about your fondest memories from when you were young – warm cookies fresh out of the oven that your mom made, Thanksgiving dinner with your family, opening presents on your birthday. These were all very positive experiences when you were young and impressionable, and many years later, that smell of cookies still brings about good feelings. Now think about your fears – heights, spiders, snakes, the dark, enclosed spaces – hopefully no one is afraid of all of those or I may have lost a few readers… Our pets have the same types of feelings. For my dogs – chew toys with squeakers, grabbing the leash for a walk, and putting on socks set off something inside their head that makes them burst with excitement (don’t ask me where that last one comes from). Unfortunately my older dog Alli also has some fears that make her tremble – most notably loud noises, not being near me, and the dreaded nail trimmers. At this time of year we see a lot of puppies and kittens that have found new families over the holidays, and so I thought it would be appropriate to talk about how to properly socialize your new pet to give it a good outlook on life! Before you point to me as a bad example of how to socialize your puppy (or kitten), we need to discuss the socialization period and how it affects future behavior. I rescued my dog when she was 6 months old, the main socialization period in puppies and kittens is between 4 and 16 weeks of age. At 4 weeks of age (give or take a week), their brain and spinal cord have developed and matured and they have a natural motivation to approach unfamiliar objects and people. 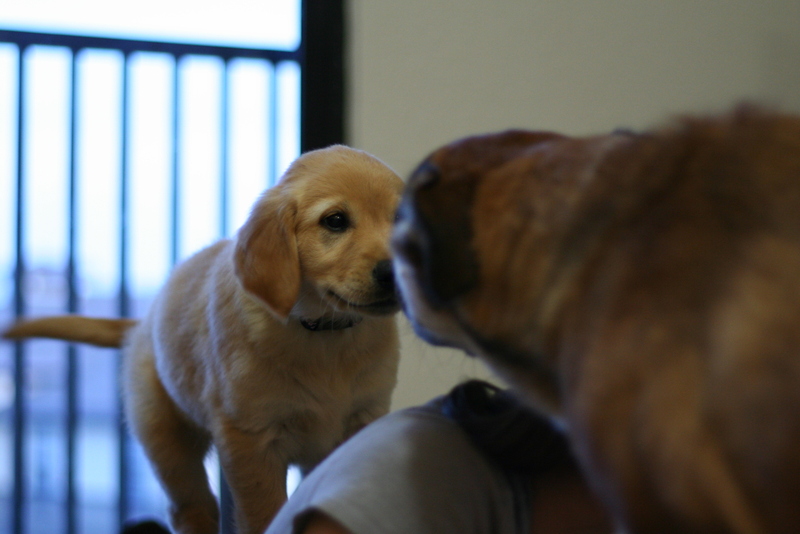 Throughout puppyhood, there is a slowly increasing tendency to react fearfully to anything new. At some point, usually 14-16 weeks, this fearful tendency will eventually outweigh their curiosity, and this is usually when the socialization period ends. At this point, the experiences during the socialization period have formed such strong associations in their brains, that happy memories and fears are ingrained almost to the point of being an involuntary reflex. There is a lesser period of socialization that occurs at some point during adolescence (some believe 4-6 months, some up to 12 months), but the main one happens at a very early age. My dog already had some fears and phobias when I got her that likely developed during her socialization period. All was not lost though, as I was able to help her (mostly) overcome these fears through other behavioral techniques (desensitization and counter conditioning – a topic for another article). The core of puppy and kitten socialization is exposing animals to novel stimuli in a positive and non-threatening manner, and avoiding negative stimuli. An important point to make is that socialization is not just about keeping your new pet away from bad things, but exposing them to as many new things (in a positive manner) as possible. It’s not enough to have your friends come over to the house, or to bring other pets around your new puppy or kitten, they need to be exposed to EVERYTHING! A puppy or kitten that has not been exposed to, let’s say, a tall man, or a nail trimmer, may react fearfully to that thing when they are older, even though they’ve had no prior experience with it. To give you a good example of what kind of things you can do to socialize your puppy (or kitten), I’ll go through what happens during a typical day at puppy and kitten socialization at Mesa. Typically, our assistants will bring the puppy around to meet everyone in the hospital. While meeting us, the puppy is usually wagging its tail, running from person to person, and loving life (and the treats we give). They will be exposed to the sights, sounds, and smells of other dogs in the hospital while doing this, along with other pets here for socialization. They will get their nails trimmed, ears cleaned, listen to a soft thunderstorm CD, all while getting attention and treats. If at any point the puppy seems scared or is not enjoying things, the attention is scaled back so as to not overwhelm the puppy. These experiences have now formed a positive association in their brain, so powerful that they may even enjoy coming to the vet in the future! When you get your new pet, I would encourage you to begin socialization right away, but in a controlled environment. I believe the benefits of socialization far outweigh the risks (such as exposure to infectious disease), as long as we minimize the risks. Do not bring your pet to uncontrolled areas such as the dog park, pet store, or any area where unvaccinated and non-dewormed pets may be present; there is a risk of your pet catching something. However controlled environments such as certain puppy classes, a friend’s house, or even our hospital, are excellent opportunities! Bring your new pet in the car with you frequently and give it treats, give it a bath at home and spread treats around the edge of the tub, touch its feet and ears while giving treats; did I mention you should buy lots of treats? After all, food is the number one motivator in dog training. Make sure you back off and give your pet space if it feels overwhelmed. I also encourage new pet owners to give your pet some “me-time”. Have a crate or safe gated area with toys (food stuffed toys are best) where your new pet can learn to entertain itself and develop some self-confidence. This can help prevent over-attachment and separation anxiety issues in the future. 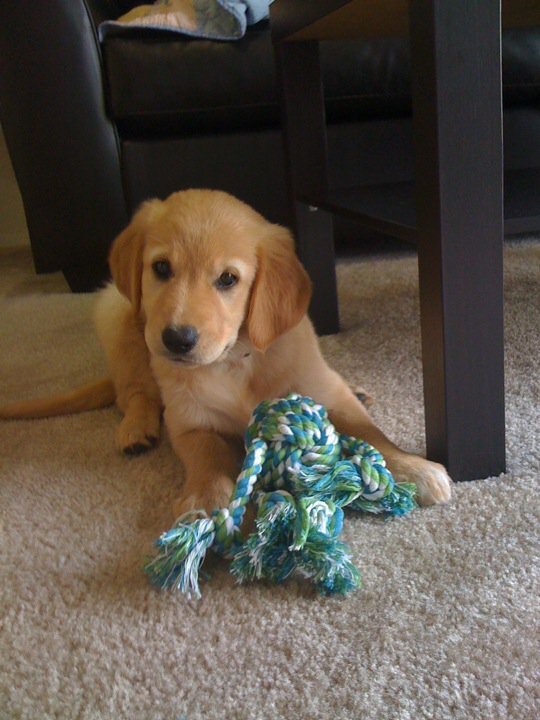 Continue this socialization program even past 16 weeks of age as dogs and cats are always able to learn. Socializing a new puppy or kitten is hard work, but having a well-behaved and socialized pet pays off in the end, not to mention that a few months of work gives your pet a great head start to a happy life. If for some reason you’re not able to devote that much time to your new pet, I highly recommend bringing it in to Mesa for socialization; playing with puppies and kittens is one of the harder parts of our jobs, but we’ll make the sacrifice! I received a frantic call from my wife while at work last month. She was walking our dogs on the trail behind our neighborhood when they started getting agitated, sniffing the ground and pacing back and forth along the trail. Our older dog, Alli, started pulling on the leash trying to head in the direction of a dog that was on an adjacent trail, about 20 yards away. Problem was, it wasn’t a dog, it was a coyote. My wife started walking quickly with the dogs back to the neighborhood, but the coyote followed, slowly closing in. This was about the time I got the phone call. As I was talking to her (and she was picking up rocks to put in her pocket) she made it back to the neighborhood, but the coyote still followed. It actually followed her all the way to our house, when it finally disappeared. Many small dogs look like a perfect meal to coyotes, the thing is my dogs are 50 and 70 pounds, and were on leash with my wife right next to them. The very next day at Mesa, we heard two similar stories about coyotes, and within the next month saw a few coyote attacks and had a few owners report their dogs missing. We all know that coyotes are out there, but at Mesa we are seeing a trend towards coyotes becoming more aggressive and more daring than they have been in previous years. They are smart, adaptable predators, and if hungry enough will venture into neighborhoods and civilized areas, and lately have shown no fear in approaching humans or larger dogs. I have heard stories of coyotes luring dogs away from owners by acting playful and when they get close, attacking. They have been known to jump fences and carry away small dogs and cats that are unattended. And more often than not, when you see one coyote, its pack-mates are waiting close by. Without sounding too sensational, if you live in Colorado, even in a city, your pets are at risk for being attacked or killed by a coyote. I recommend not leaving small dogs in the yard unattended, especially during the dawn and dusk hours when coyotes are most active. While on a trail at these hours, keep your dog close and if not on a leash, be ready to leash them if necessary. Any cat who spends time outdoors is at risk. By taking the proper precautions, and being aware of the dangers, we can hopefully reduce the number of wounded and missing animals we see and hear about at Mesa, and keep your pet safe.